Described as the ‘TripAdvisor for jobs’ TheJobCrowd is unlike any other early career employment brand. TheJobCrowd creates The Top Companies for Graduates to Work for & The Top Companies for Apprentices to Work for. The ranking is based exclusively on results of feedback from employees at those companies. We collect feedback annually through our survey and publish the results in September. 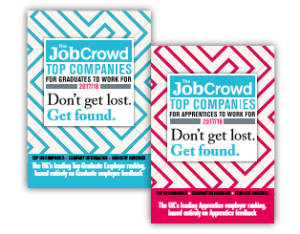 TheJobCrowd contains a wealth of information to guide early career candidates through the confusing maze of choosing an employer. We wish you the best with your job hunting, and remember, Don’t Get Lost; Get Found.